Attosecond science has revolutionized the way we look into the time-dependent evolution of the microscopic world, where the behaviour of matter is governed by the rules of quantum mechanics. 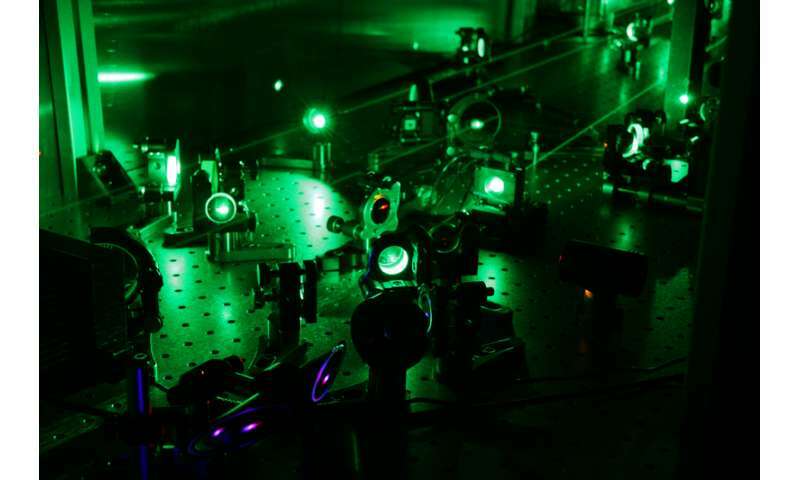 The technological breakthrough that made possible the development of the field is based on the generation of ultra-short laser pulses that last only a few oscillations of the electric field. These short pulses have a focused intensity where the electric field is comparable to the one electrons experience inside atoms and molecules. It is possible to control both the exact temporal shape and the waveform of these ultra-short pulses. While ultra-short laser pulses have been used in a few laboratories worldwide to study light-induced dynamics in atoms and molecules, many questions remain unanswered, due to the low data rates and inherently low SNR achievable with current state-of-the-art laser systems. At the Max Born Institute, a powerful laser system has now been completed, capable of reproducing the parameters of laser systems typically used in attosecond science experiments, but with a 100 times higher pulse repetition rate. This new laser system enables an entirely new class of experiments in simple atomic and small molecular systems, as well as high fidelity investigations of more complex molecules. In the last 15-20 years, the availability of light pulses in the extreme ultraviolet (XUV) region of the electromagnetic spectrum, with durations in the order of hundreds of attoseconds (1 as = 10-18 s) has enabled the emergence of the field of attosecond science. Utilizing these extremely short pulses scientists have gained unprecedented insight into the time evolution of electrons in atoms, molecules and solids, by taking advantage of the pump-probe technique: The system under investigation is excited by one "pump" laser pulse und after some time delay a second "probe" pulse interrogates the system (e.g. through ionization). The dynamics induced by the pump pulse can be retrieved by repeating the experiment at different delay times. Using the pump-probe technique a number of impressive results have been obtained in the last years addressing topics like light-induced charge migration, multi-electron correlations, and the coupling between electronic and nuclear degrees of freedom. Typically the velocity distributions of ions or electrons generated during the pump-probe sequence is determined experimentally or the transient absorption spectrum of the XUV pulse as a function of the pump-probe delay is detected. Often the light-induced processes are complex and measuring only one observable is not sufficient to fully understand the experimental results. Already several years ago, thanks to the development of the so-called "reaction microscope," a great improvement was achieved. This apparatus enables a measurement of the three-dimensional velocity distribution of all electrons and ions created in the pump-probe process The drawback of this technique is that very low signal rates are necessary, i.e. only 10 percent to 20 percent of all laser shots should induce the formation of an electron-ion pair. This leads to very long measurement times using current state of the art laser systems. Pulses in the XUV with attosecond duration are produced when a strong laser pulse in the VIS-NIR interacts with a gas of atoms in a process called high-order harmonic generation (HHG). In order for a single XUV pulse with attosecond duration to be formed during the HHG process, the laser pulses interacting with the gas should last only a few oscillations of the electromagnetic field, which typically means less than 10 fs (1 fs = 10-15 s), and the exact temporal shape of the pulse must be controlled. The most widely spread way of producing such laser pulses consists in amplifying short pulses with a controlled waveform (Carrier-Envelope Phase- or CEP-controlled) in a Ti:Sapphire laser amplifier and shortening the duration of the pulses via non-linear pulse compression, using e.g. a gas-filled hollow-core capillary. However, the pulse repetition rate of these systems is typically limited to a few kHz, and a maximum reported frequency of 10 kHz, due to detrimental thermal effects intrinsic to the laser amplifiers. Now, researchers at the Max Born Institute in Germany, in collaboration with colleagues at the Norwegian Defence Research Establishment, have designed and built a laser system capable of operating at much higher pulse repetition rates than the typical Ti:Sapphire amplifiers. The newly developed system is perfectly suited for performing pump-probe experiments in attosecond science implementing electron-ion coincidence detection in a reaction microscope. The system is based on a noncollinear optical parametric amplifier (NOPA). In a parametric amplifier, the energy from a strong pump pulse is transferred to a weak signal pulse in an instantaneous nonlinear interaction in a crystal. The gain and the bandwidth of the process are determined by conditions of phase-matching, that is, by ensuring that all the photons at the signal frequency are emitted in phase and add up coherently as the signal pulse propagates in the crystal. When the pump and the seed pulses enter the crystal subtending a small angle (noncollinear geometry), the bandwidth of the process is maximized and it is possible to amplify ultrashort pulses lasting only a few cycles. Moreover, since the process is instantaneous and there is no absorption of light in the crystal, there is no heat accumulation and thermal problems are almost negligible. Therefore, NOPA amplifiers are well suited for high repetition rates. In the laser system presented in a recently published article in Optics Letters, the researchers amplified ultrashort CEP-stable pulses from a Ti:Sapphire laser oscillator in a NOPA amplifier pumped by a high repetition rate commercial Yb:YAG thin-disk laser. In the parametric amplifier a large fraction (about 20 percent) of the energy of the pulses from the Yb:YAG system is efficiently transferred to the ultrashort CEP-stable pulses from the Ti:Sapphire laser oscillator. The NOPA system is thus capable of delivering pulses with 0.24 mJ of energy at a repetition rate of 100 kHz, resulting in an average power of 24 W at an approximate central wavelength of 800 nm. After compression, filtering of parasitic second harmonic and a broadband variable attenuator for controlling the power incident into the experiments, CEP-stable pulses with 0.19 mJ (19 W) and 7 fs duration (i.e. 2.6 cycles) are available for experiments. The system will be employed for HHG and isolated attosecond pulse production, and will be the basis of an attosecond pump-probe beamline with coincidence detection capabilities.